Some of our friends have asked us how God has us led to work with Hispanics on the US/Mexico Border? An area that many see as a very dangerous place to live. Just pick up your newspaper, and almost everyday there is something unpleasant written about what is happening. They wonder why we would go there since I had been kidnapped in Mexico City, and I also had my car stolen at gun point? I can tell you those were not fun experiences! There are several answers to these questions. One is that the Lord has done a tremendous healing work in our lives over the last 11 years, since we left Mexico. Second, God has put a special love in our heart for the Mexican people. This love was rekindled when we made a trip to Chula Vista in March of 2010. God brought together a number of things on that trip. One big happening is we were able to reconnect with our good friends, Issaid and Mie. 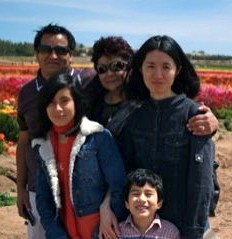 Issaid and his family were in the first church plant we started in Mexico City. He was just finishing up high school and starting college when I met him. At that time I was working with young people. I spent a lot of time at the Arechiga home with Issaid and his brothers, Sinuhe, and Jahaziel. We studied the Bible together, and we played together. They taught me how to play dominoes. I never was very good at it, but we had a great time. Then Issaid met and married Mie. Mie is from Japan. She came to Mexico to study Spanish. I guess you could say she got more than she bargained for. Issaid has been a great friend and helped me with a lot of things in Mexico, such as painting my house, and driving my broken down car to the Border. He has been one of my closest friends, but I lost touch with Issaid when we moved to Colorado, and he and his family moved to Tijuana. Well, about a year ago I found Issaid on Facebook (a wonderful tool for finding friends), and I asked him where he lived. He said, “National City.” I asked, “where is National City?” And he said “it’s right next to Chula Vista, about a ten minute drive.” So when we went out to visit Chula Vista to check out the ministry there we reconnected with Issaid and Mie. It was so good to see them again. This is something the Lord has done, and it’s just one of the many things He did to pave our way to the Border. It gave us a connection with someone close that we know from Mexico. My hope and prayer is that in some way Issaid and Mie will join us in our work on the Border. Cool story, Dave. I love how God used an old friend to re-connect you with Mexico. So excited for you guys. We will be praying for Gospel transformation on the border! Thanks Jeremy – we are encouraged by how God is bringing our past experience into the present. You have a beautiful family. I enjoy looking at the pictures. If I remember correctly you are about to add a little girl to the family. When is that happening? Thanks for keeping us update on what’s going on with you. I may be visiting in late February – that may not be a good date for you since your daughter is due sometime in February. We’ll see – it would be great to see you guys!